This is a short bonus post to give you a quick cookbook update. 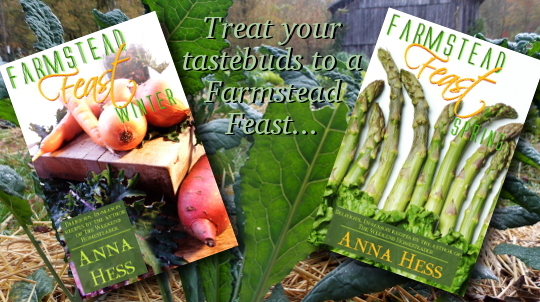 I was surprised by the interest in the paper version of Farmstead Feast: Winter, so I decided to go ahead and put out the paperback version of Farmstead Feast: Spring ASAP. Both books are still priced at the bargain-basement price of $3.99 and are eligible for Amazon's free shipping, so nab a copy now while they're cheap. Finally, I wanted to thank those of you who took the time to read and review so quickly. With the help of a Bookbub ad and your kind words, Farmstead Feast: Winter spent 24 hours as the number one free book on Amazon this week! It's thrilling to get in front of 40,000 new eyes and I hope my recipes make everyone's spring a little more delicious. Thank you so much for helping make it happen! I made the quiche,,, er, tomato pie and it was delicious, even without the bacon... i substituted smoked paprika, and a few sprinkles of fake bacon bits for the flavor., we dont eat processed foods, but the very occasional use of the soy bacon bits seems harmless enough. Anyway, it was a big hit. Along with a kale salad ,,, yummy! deb --- So glad to hear it worked out for you, especially with the vegetarian option!